Between 2010 and 2015, national readmission rates fell 8 percent, thanks in part to the implementation of the Hospital Readmission Reduction Program and other CMS-led quality improvement initiatives, according to a Tuesday blog post by two CMS officials. In fact, Medicare 30-day readmission rates fell in 49 states and Washington, D.C., from 2010 to 2015. Only Vermont saw readmissions increase during that time period, albeit readmission rates in the state rose less than 1 percent (0.7 percent). 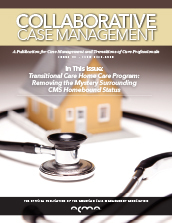 The date for the 2016 National Case Management Week is quickly approaching, Oct. 9–15. The 2016 theme is "We Listen. We Care. We Lead." Now is the time to make plans to recognize the dedication, compassion and patient care outcomes achieved by case management professionals in your organization. Visit acmaweb.org/cmweek for celebration ideas, educational materials and more! Items are also available for purchase in the Case Management Week store. The application period for CMS' Comprehensive Primary Care Plus program closes Thursday. The five-year program is slated to begin January 2017 for about 5,000 primary care practices and will likely qualify as an advanced Alternative Payment Model under MACRA, the Medicare Access and CHIP Reauthorization Act. For practices interested in CPC+ participation, here are five articles from the pages of Becker's Hospital Review with more information on the program. Elderly Americans' well-being is at risk unless the U.S. does much more to help millions of family caregivers who sacrifice their own health, finances and personal lives to look out for loved ones, reported a study released Tuesday. Nearly 18 million people care for a relative who is 65 or older and needs help, yet "the need to recognize and support caregivers is among the most significant challenges" facing the nation's swelling elderly population, their families and society, according to the report from the National Academies of Science, Engineering, and Medicine. The welcome packet for families at the health clinic of Dayton (Ohio) Children's Hospital got a little thicker recently, with the addition of a new survey asking simple questions not about allergies and medications but about daily life at home. Do they have access to nutritious food? What about water and electricity? The questionnaire is part of a new program, the Family Resource Connection, that screens families for basic social needs, then connects them with resources. Ineffective transitions of care are a huge expense for the health care industry, even more so if the patient's readmitted in the 30-day postdischarge window. It is estimated that Medicare pays $15 billion each year to cover the costs of readmissions, of which $12 billion is for cases considered preventable.1 In an effort to better identify these preventable readmissions, Medicare created 2 new codes, 99495 and 99496, which are reimbursable for non-face-to-face and face-to-face transitional care coordination services.